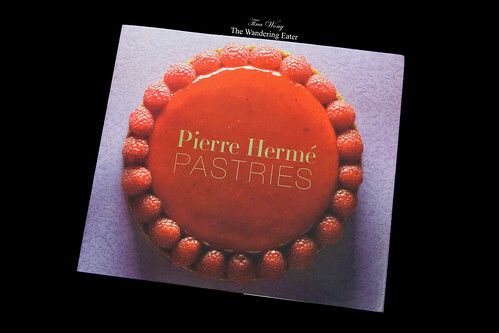 Pierre Hermé Pastries by Pierre Hermé, published by Stewart, Tabori and Chang. Is probably the most talked about dessert cookbook of 2012 after reading through a number of tweets from the food community. 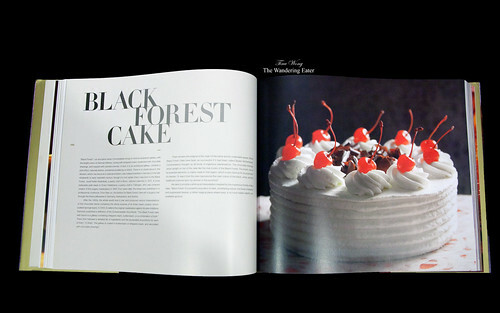 Hermé’s book is broken down into four sections: The Doyens of Pâtisserie, Pâtisserie with Terrior, Mutli-Storied Pâtisserie, and La Pâtisserie Moderne. The Doyens section is based on ancient dessert pastries that had originated many centuries ago that most food historians might not be able to pinpoint the year it existed but many pastry chefs still make them today carrying on the traditional recipes (a few examples are crêpes, macarons, gingerbread, etc.). Pâtisserie with Terrior is about recipes that has an identity with a certain geographic area (e.g. cookies (American) compared to French sables, Gâteau Battu (beaten cake; a broiche-like cake that’s a specialty along the coast of Picardy), linzer torte, etc.). The Multi-Storied Pâtisserie is based on desserts that have a long history of different cultures having the same dessert like ice cream, trifle, chocolate cake, and so forth. La Pâtisserie Moderne (translated to “the modern pastry”) is pretty self explanatory. The book is essentially dessert recipes with some dessert history but most the important part is Hermé’s ingenious takes of traditional recipes with his somewhat quirky (meaning savory) twist. If you do manage to your hands on this book, look up the recipe “Tango” or what my friend Stephane of Zen Can Cook baked recently you’ll know what I mean. I do highly recommend you to use a food scale for this book since converting from metrics (grams) to volume (cups) is not precise, which might result an “off” pastry. A few examples of my successes with Hermé’s recipes are his Ispahan Paris-Brest. 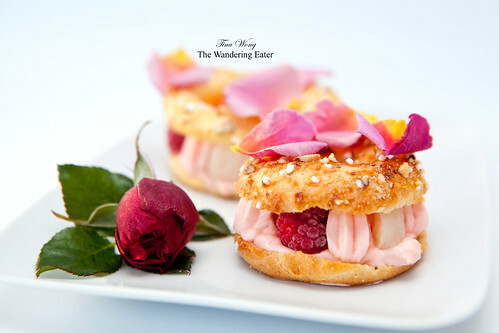 It is based on the traditional soft choux pastry but it is filled with his signature flavor, Ispahan, a mixture of rose, raspberry and litchi. I made a batch of these for one of my recent dinners and my guests were swooning over this. The soft yet crunchy from the craggy pearl sugar and chopped almonds, choux meets the ethereally creamy, fruity filling of rose mascarpone custard with chunks of litchi and fresh raspberries to make one explosive flavor. I do admit, this flavor (and the photo) seems feminine but it’s delicious and my guests of both genders devoured it. The Cheesecake Mosaïc is the cheesecake of my dreams. I baked at least a dozen variations of cheesecakes for the past decade but Hermé’s interpretation is interesting and it isn’t as remotely dense as a New York-style cheesecake. 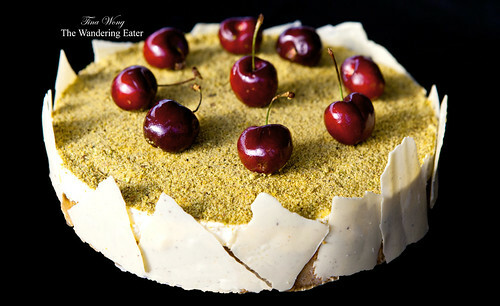 His version has a combination of salted white chocolate squares, pistachio cheesecake and dotted with poached sour cherries within. The best part it does not require a lengthy baking time like traditional cheesecakes do. Only the crust and the pistachio cheesecake layer is really the parts that needed to be baked. Otherwise, the remaining layer of pistachio and cream cheese mousse is sets in the refrigerator. 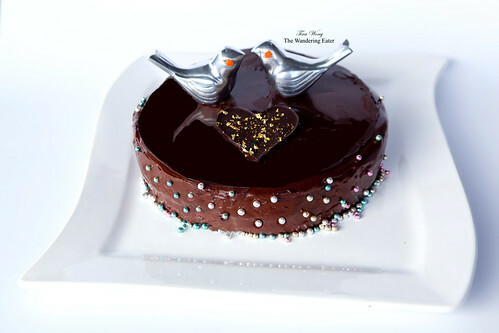 And for those of you who have seen my post around Valentine’s Day, I posted the recipe of the Carrément Chocolat Cake. 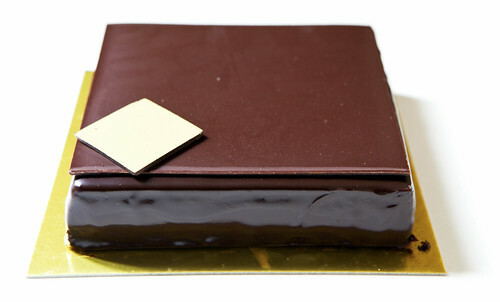 I was a bit surprised to learn that it was Hermé’s modern take of the Sachertorte. If you read between the two recipes, the Carrément Chocolat Cake is more challenging since there are six components to make this one cake rather than two for the Sachertorte. I did have a first hand experience of the Carrément Chocolat Cake back a few years ago when I vacationed in Paris (as seen on the above photo on the right). The cake I baked did bring back vivid memories of this incredibly chocolate-y cake (sans the dragées). It is a lot of work but if you want an extraordinary chocolate cake, this is worth the time, effort, and the pound and a third or so worth of excellent chocolate. In all, if you admire Mr. Hermé’s work and actually like to bake something challenging and have interesting flavors, this is your dessert cookbook. It can be a beautiful coffee table tome but in my opinion it is a lot more than that. May be purchased at your local bookstores, Amazon, and if you’re in NYC, stop by the excellent cookbook/food literature store, Kitchen Arts & Letters.